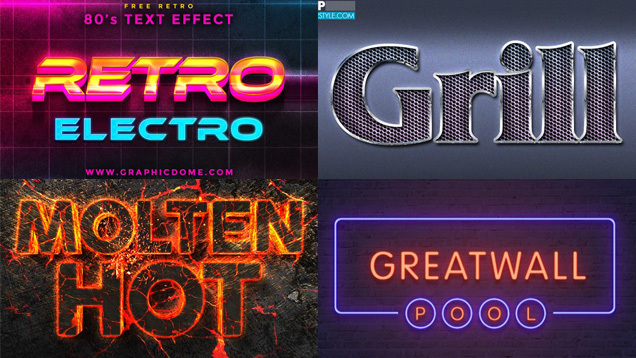 We searched for free Photoshop text effects as inspiration to create our own music producing synthwave logo and we want to share the best we found this month with you. When you are operating in the synthwave music scene sooner or later you also need such a sparkling 80s synthwave logo for your band or online magazine! There’s no getting around it! If you’re not so lucky to have a good graphic designer nearby you can hire someone really cheap in East Asia via outsourcing services like Fiverr, Envato Studio or Upwork. But I decided to make my own Layer Styles in Photoshop because I am a big fan and user of Adobe Photoshop since we bought our first Apple Macintosh Performa in 1996 which was an All-in-One Computer like the iMac is today. So let’s stop talking and have a look at the free Photoshop text effects! Some free Photoshop text effects templates contain Smart Objects. These are layers that contain raster or vector images from Photoshop or Illustrator files. Smart Objects sustain an image’s source with all its characteristics so that you can apply nondestructive transformations to the layer. You can embed the contents of an image in Photoshop CC and CS6 into a Photoshop document. In Photoshop CC, you can also use Linked Smart Objects which are referenced from external image files. When the source image file changes the contents of a Linked Smart Object are updated. Within a Photoshop document Linked Smart Objects are distinct from duplicated instances of a Smart Object. Web designers often use a shared source file in multiple Photoshop documents to make later changes easier. Use nondestructive filters. You can edit filters that are applied to Smart Objects. Work with vectors like vector artwork from Illustrator, that otherwise would be rasterized. Perform nondestructive editing. You can rotate, scale, distort, skew, perspective transform, or warp a layer without losing original image data or quality. Try multiple designs with low-resolution placeholders that you can replace with the final versions later. Change one Smart Object and automatically update all its linked objects. Use a layer mask that’s linked or unlinked to the layer of the Smart Object. When you find a great looking free Photoshop text effects template you should grab and tweak and adjust it to your personal style. If it contains Smart Objects, it is often very complex designed and even better looking and easier to edit. Don’t underestimate the time needed to create your own layer styles from scratch. Better invest around 5 bucks for a stunning template! The template should also contain the Adobe Layer Styles as external .ASL file so that you can add all styles easily to your own Layer Styles panel. You can find two of our favorite designers at Graphicriver and Creativemarket. Please remember: Adobe Photoshop files do not include the fonts used. They should be either included in the template or the download link should be mentioned in the description of the template. Then you must download these fonts and install them on your operating system! You can use both TrueType .TTF and OpenType .OTF fonts mixed on Windows and Apple systems. In our category “Photoshop Layer Styles” you can find more interesting Photoshop articles including some of our own Layer Style creations to download. Subscribe to our monthly newsletter, YouTube or Twitter so you don’t miss any of our future Freebies!